New Target Beauty Box Released! 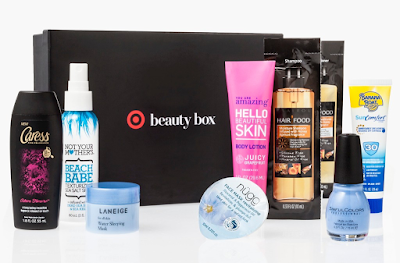 I got online this morning to find that Target has released another Target Box! I had shared on Facebook over the weekend that there was going to be another box, and here it is! If you didn't see the update, make sure to like and set 'See First' on Facebook to see future updates! This box is again, $5.00 (plus tax) and you get free shipping again! This does include a similar item as one of the boxes from January, which seems to be happening more and more. Obviously, I'm still getting the box, because they are so addictive and awesome for being so cheap! Check out past Target boxes here! Let me know if you get this box!